Vasily Fedosenko/REUTERSA cyclist rides past a Ukrainian armoured personnel carrier (APC) at a check point in the southern coastal town of Mariupol September 4, 2014. Intensified shelling and military activity by Russian-backed separatists in eastern Ukraine have raised fears that the rebels may try to take a crucial port city, Europe Secretary General of the Organisation for Security and Co-operation Lamberto Zannier told Interfax. According to Zannier, the most intense shelling by rebel forces occurred in the region around Mariupol. Mariupol is the second largest city in Donetsk province. Although separatists have announced the creation of the Donetsk People’s Republic, Mariupol has remained under Ukrainian government control. The sharp uptick in hostilities around Mariupol comes as NATO announced that it has observed columns of military equipment moving into Ukraine from Russia over the past two days. The military columns have included tanks, artillery, and combat troops. However, NATO does not have a good idea of how many columns have moved into eastern Ukraine. Information and Analysis Center of the National Security and Defence Council of Ukraine. The sudden renewed Russian military involvement in Ukraine has a strong possibility of being focused on taking Mariupol. The port city sits on the Sea of Azoz, and it blocks Russian access to Crimea. By seizing the city, Russia would effectively be well on their way to creating a land bridge connecting Crimea to the Russian state. Ivan Lozowy, a policy analyst based in Kiev, believes that the seizure of Mariupol and the creation of the land bridge is a top priority for Putin. 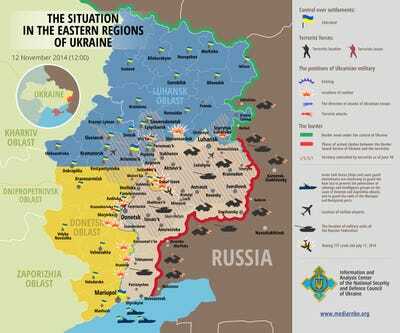 However, any battle for Mariupol is likely to be drawn out and bloody. 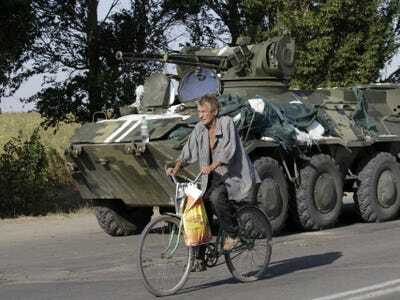 The city is “is pretty much dead set against letting the Russian troops through,” Lozowy says. Locals within the city have been aiding Ukrainian troops build fortifications and defend against any separatist incursions. The Interpreter LiveBlog is following the situation.